Every time I come home to my colorful abode, I thank my lucky stars for a landlord who allows paint. But since moving into the place over year ago... I've had yet to get around to the apartment's eyesores: the kitchen and bathroom. The kitchen is quite large, making it a big task to tackle. 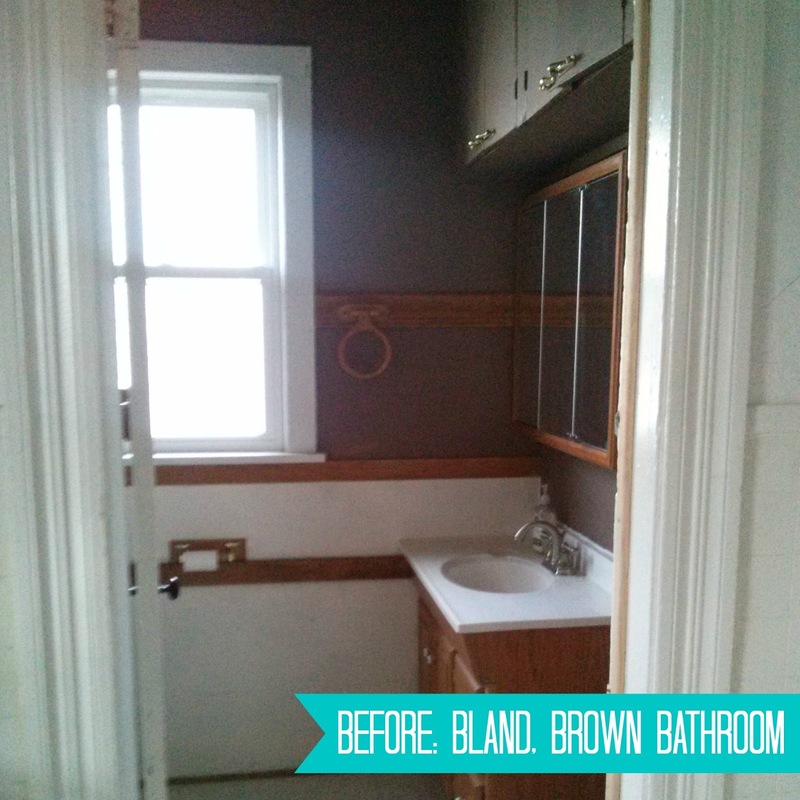 However, the bathroom is teeny-tiny – making for a perfect day-off DIY project. Yesterday, I had the day off and some time on my hands. While scavenging my supplies closet (a project in itself, as I'll soon be turning it into a pantry), I came across a near gallon of leftover paint from when I made-over this Ikea desk. A light bulb turned on over my head. So I started painting! I didn't prime the brown since it worked well as a base, so the walls got two full coats followed by a round of touch-ups. The white section was more difficult to cover since the white wanted to shine through and the texture was different, so it took three coats followed by a round of touch-ups. Over the summer, I used Chalk Country Chalk Paint on a chair and loved the results. I had two more containers that I'd set aside for a larger-scale project. So I used three coats of Crisp Collar on the trim and mirror frame. And I painted two coats of Santa's Coal on the vanity base. Pssst! One 8 oz. 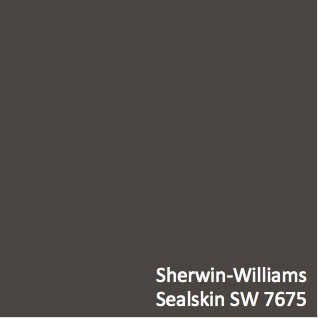 sample of Chalk Country Chalk Paint costs $14. I used about 4 oz. to paint my vanity and about 2 or 3 oz. 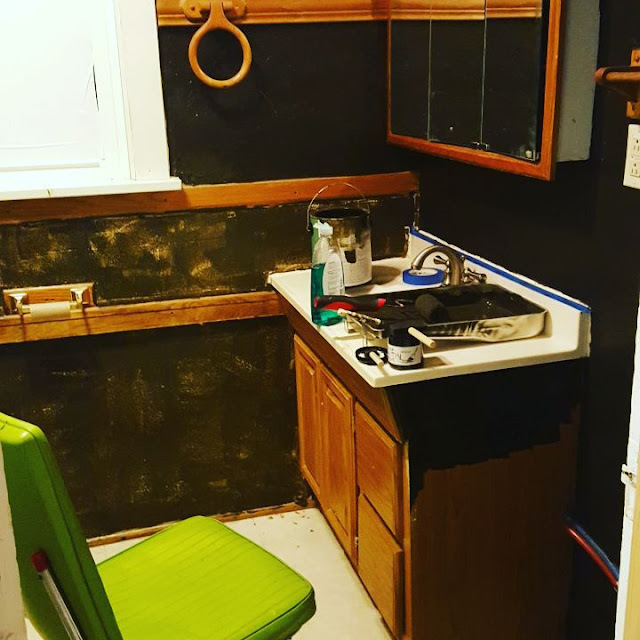 to paint the trim. A little bit of this stuff goes a long way – especially since primer is unnecessary! I'm thrilled with the final result! I don't even recognize my bathroom! (I still have a few more things to do. Like wall touch-ups and painting that strip of wood trim along the floor.) 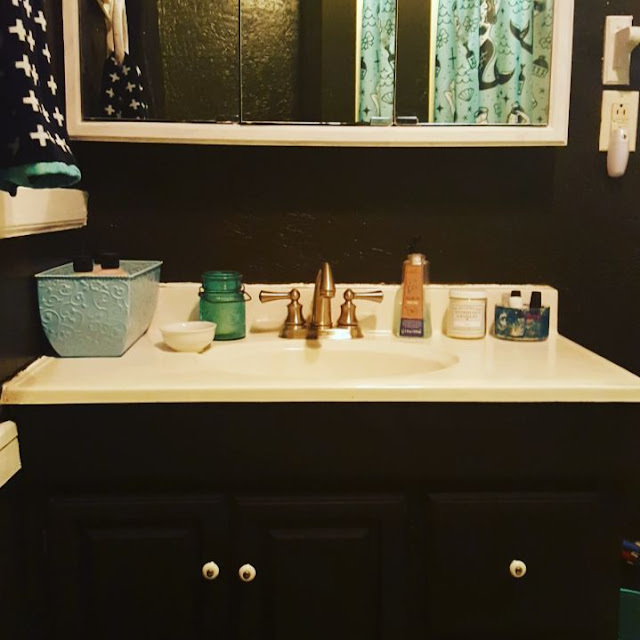 But the Santa's Coal chalk paint on my vanity looks fantastic. 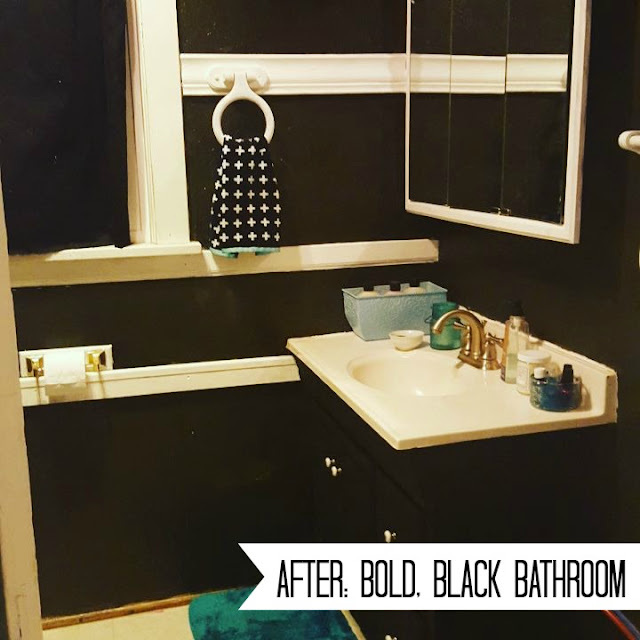 The walls are slightly darker than charcoal and the vanity is slightly lighter than gray... I love how the dark shades work together. 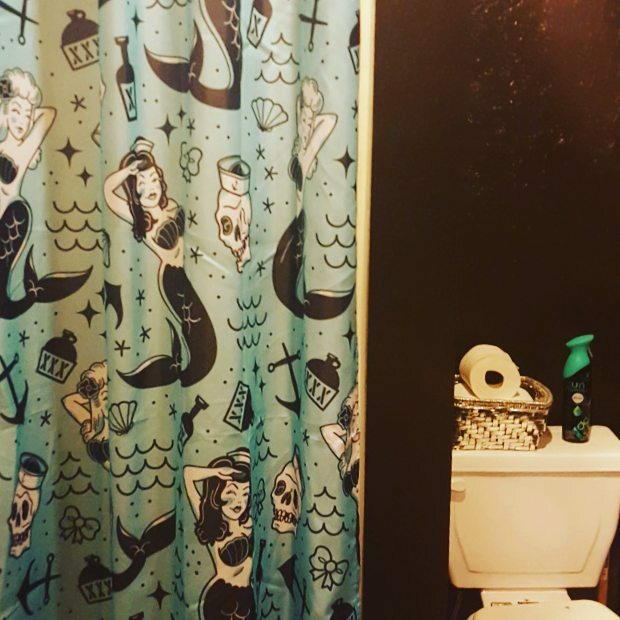 I adore how my turquoise, black, and white mermaid shower curtain pops against the dark walls. My vanity/sink is a complete transformation! It's my goal to keep this bathroom clean and tidy. 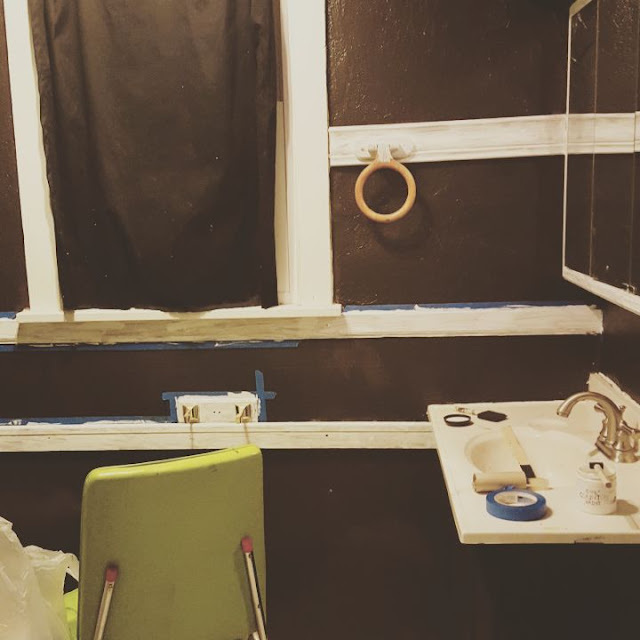 Going from a spacious, bedroom-sized bathroom in my old place to this cramped powder room has been a challenge because it gets cluttered and overwhelmed so easily. I think giving it this day's worth of TLC will help me to take pride in its decor and looks. Learn more about Chalk Country Chalk Paints in my original review post, or visit the Chalk Country website here. I love the dark! Awesome!